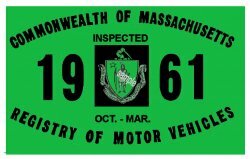 1961 Massachusetts FALL Inspection Sticker - $20.00 : Bob Hoyts Classic Inspection Stickers, Add a Final Touch to your Restoration! This 1961 Massachusetts FALL INSPECTION Sticker was issued from October 1961 to April 1962 and they were good for one year. THIS STICKER IS NOW AVAILABLE thanks to Paul Morrison, Foxborough, Mass.